First half marathon of the year and half marathon #31. This was the second time I've been to this event as my first was last year. Another awesome trail race. I really love the challenge of this course. It's one of my more difficult half marathons but so much fun and rewarding when you finish it. I'll be running this one again in the future. This year, I'm running the Serious Series and this is the first of three races in the series. I highly recommend this race. 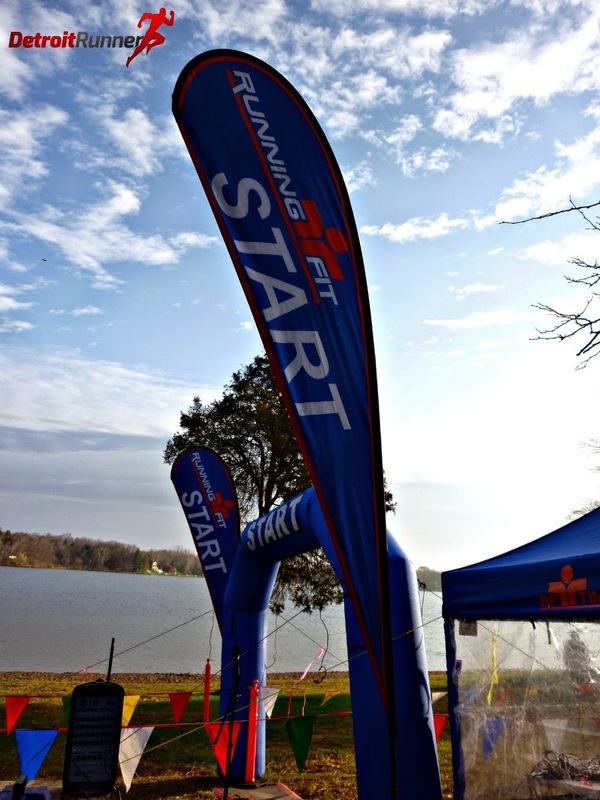 Registration is always easy with Running Fit events and this was no exception. A press of a button on their website and I was registered to go. Packet pickup is also very easy at this event. It's open a couple hours before race day and because it's a trail race with limited number of runners, it makes for an easy process. You can see Sharry has my bib number, is holding it up, and is all ready for me! Haha! Awesome! It's nice when the volunteers know you. I was in and out of line in a matter of a minute and that was getting there within an hour of start time. The start area is a really beautiful area and off of Silver Lake. As you can see, we had an absolutely perfect day for running. The start/finish area was all set up and ready to go when we got there. The race had plenty of port-o-potties but also had real bathrooms as well. We opted for the real bathrooms. I mean, really, why wouldn't you? The sun was coming out as we were ready to start our race. Runners were hanging out waiting for the race to start. The race did the National Anthem and we were ready to race. I had no goals but to just get through it. I'm still dealing with a lingering injury so the plan was to finish between 2:15 and 2:30 hours. That was more than fast for me today. I went back and looked to see what I did last year and was 2:07. I'm not sure how I was even able to run it last year that fast. 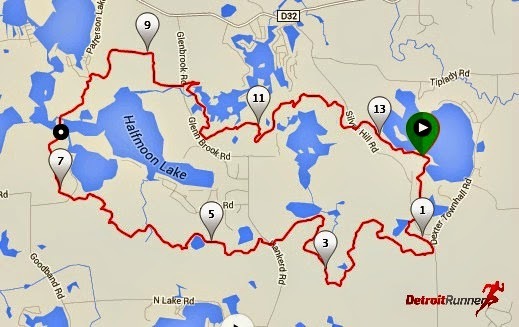 The half marathon course is a one loop course around the "Poto" trail. I love that it's only one loop. It's 99% single track with a little bit of roads. The trail is technical and hilly and a very challenging course. I love it and wish I lived closer to the area since it's fantastic training. The elevation chart doesn't even do it justice. This is one hilly course even though it doesn't look that bad on the chart. The last hill is pretty tough! As you can see, I ran the first few miles way faster than I should have until I finally had to stop at the 4+ mile and take my shoe off to get a rock out of my shoe and to take off my jacket. I wished I hadn't run with my jacket at all. The course starts off on grass which is really great as it helps thin out the crowd. There were a couple waves to help ease the congestion and I opted to start in the second wave. After a very short run, we were already at the single track and while it was still busy, it thins out as we hit the hills. The single track is incredible here and one of the best trails in the state, in my opinion. As you can see, the surface is dirt, of course, and has some smooth sections as well as highly technical sections with hills. The views, even in the spring before the leaves are on the trees, are very nice. There are also numerous boardwalks throughout the course. I also love the forgiving nature of running on these platforms and makes for a very unique running surface. In addition, the Poto has sandy parts so it tends to drain very well so it does not get too muddy. It usually has to rain a lot to get it muddy. There are a few lakes/ponds that we run by and it's always a nice distraction from the running and helps keep you pushing forward. Lots of trees roots and leaves make for a very technical course. Don't get me wrong, this is really a very runnable course but you certainly need to watch your footing. I saw numerous people fall. Fortunately, today was not one of those days for me although I did trip once but didn't go down all the way. Technical trails - watch your step! Did I mention the hills? Oh yeah, there are lot and lots and lots of hills. It seems like you are always climbing. While there are only a couple larger, longer hills, there are plenty of rollers to zap your energy. Looking from behind - I didn't even stop to take that one! If you are not climbing like above, then you are going downhill like below. Tree in way - cut it out. I caught up to our friend Susan who was having a great race but I didn't try to keep up. Haha! There is a nice bridge we got to cross that even included a hill in it! I got a great shot of the lake as I was passing over the bridge. It takes a little talent to get a nice picture while running. Haha! By the way, I took over 200+ pictures during the race so that tells you how hard it is to get good pictures while running. At some point near the end of the race, it was easier for me to walk the hills quickly and save my energy rather than try running all the hills. It proved to be the right decision and I wasn't alone in that decision. The key to this is to start running once you get to the top which takes some practice. Many people don't want to start running when they get there and it's easy to lose time if you don't start running again. I also feel like it's good mental practice to start running again when you are tired. You need that especially when you are running a trail marathon or longer distance. One of the reasons I love Running Fit events is they are marked really well. You need to pay attention to the flags and not the runner in front of you since sometimes there are several distances going on at the same time. In this case, it was just the half marathon today. Here's another great bridge we got to run over. I love it! Finally we were almost done with the course and I was happy to see mile 12 as I was ready to be done. 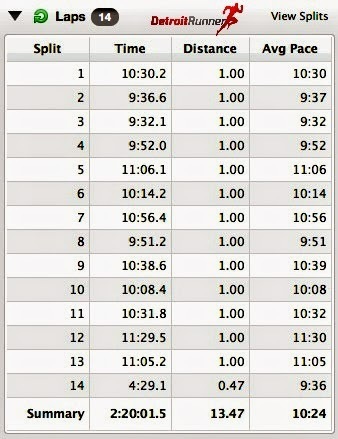 I pushed the last half mile to finish strong and got my pace down under 10 minute mile again. The finish had numerous spectators there at the end cheering us runners in. It's nice to hear a little cheering at the end. 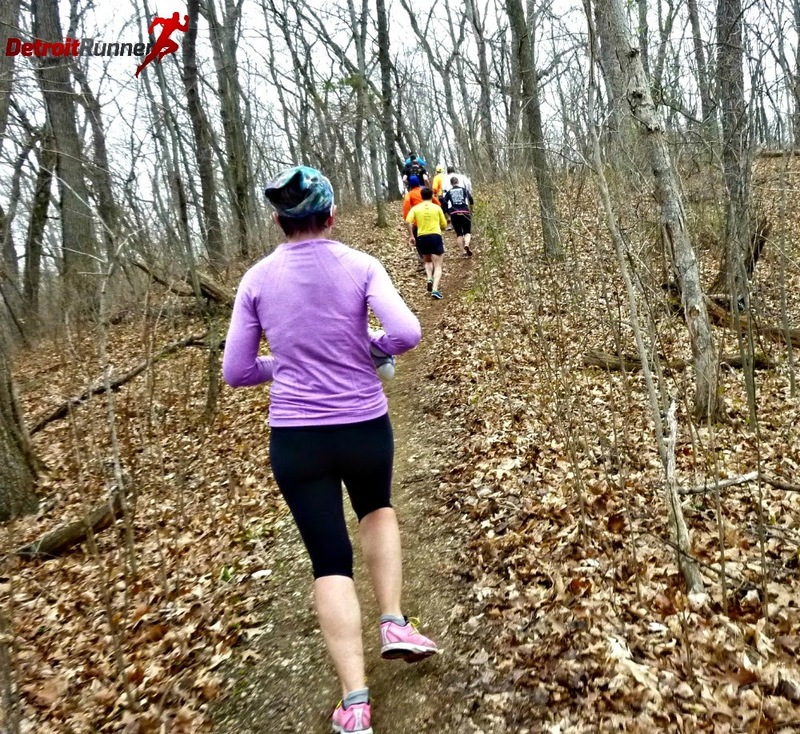 While there were a few spectators on the course, for the most part, you won't see people out there cheering so if this is what you are looking for, then trail running is probably not for you. Finally I was there and happy to stop running! Ha! Actually it was, once again, another great run through the woods. There were several aid stations and the volunteers did an outstanding job. The race had water and gatorade at every aid station as well as GU at a couple other locations. I always carry a water bottle on the course so I didn't stop at any of the stations but they were evenly spaced and fully stocked. The finish was the same as the start. We finish with a volunteer giving you your medal and also a bottle of water. The race had half muffins(which are awesome!) as well as cookies(another big plus). I believe they offered the same thing last year as well and, if I were the race management, I would not change a thing. I loved the finish line food. 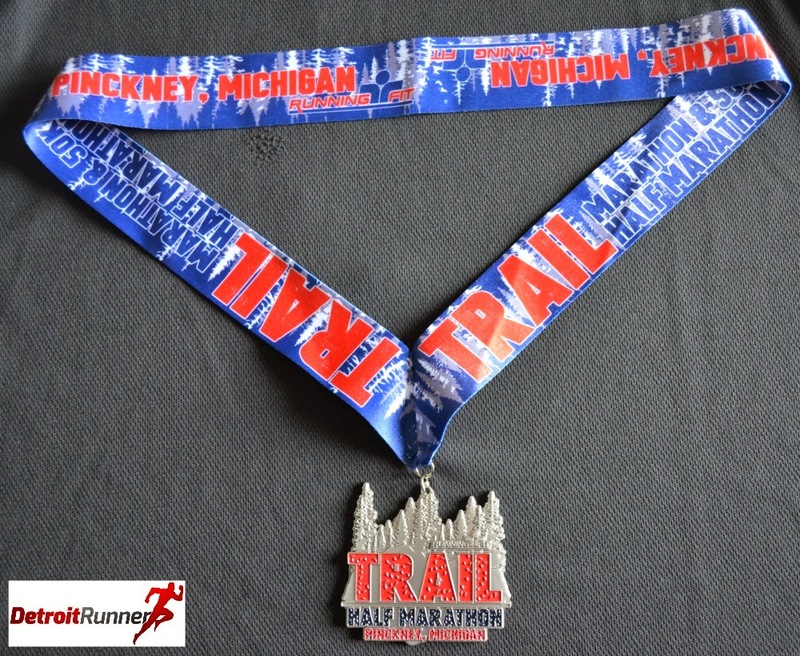 For my $46.82 entry, I received a trail half marathon bib, a race shirt, a race magnet(new this year as they have given pins out in the past) as well as an awesome medal. Running Fit has done an excellent job with running medals since last year and I hope they continue that. The design on the shirt and medal are great! 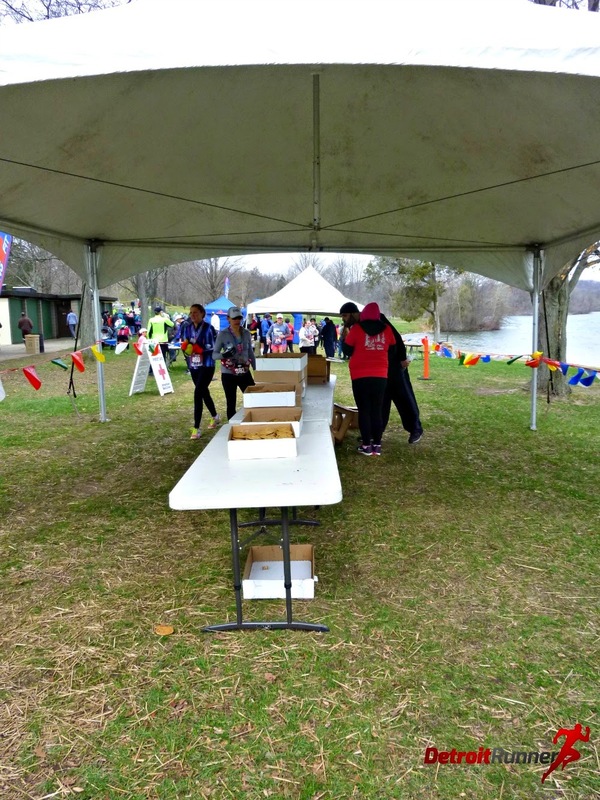 You also received a measured course for the half that was supported with volunteers. They had a road crossing that the police was also at as well to keep runners safe. I really love not only the color of the shirt but the design of the shirt. I want to be very clear on this point though - I absolutely HATE A4 shirts. These tech shirts are like running in garbage bags so I never run with them. To be fair, A4 is now offering a more breathable option but the race did not offer that kind. The shirts are okay for riding a bike or going to the gym but they are the worst shirts for running. I think it's a terrible decision on the part of race management to use them since you want people to actually use the shirt after the race. Spend the extra money and offer Brooks running tech shirts. 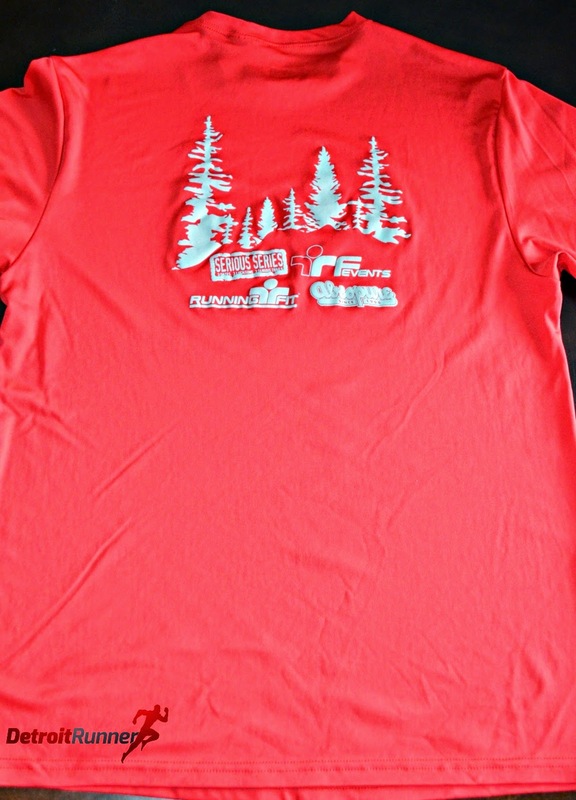 I'd gladly pay an extra $5 in race entry fees for a shirt I can actually use. The medal? Awesome! I love the design of the ribbon and the medal. An excellent job and let's hope they keep up the great work on these. The organization for Running Fit events have typically been good. Believe me, I wouldn't come back to their races if I felt differently. They have the start/finish area set up well, they have more than enough volunteers, the course is marked well, the food was good, the medal was awesome. Communication via email was excellent. I always know what's going on when attending a Running Fit event. Overall, another super trail event and I am very happy that I signed up for this and also the Serious Series. Outside of the cheap shirt, the event was outstanding and I'm sure I'll run it again in the future. 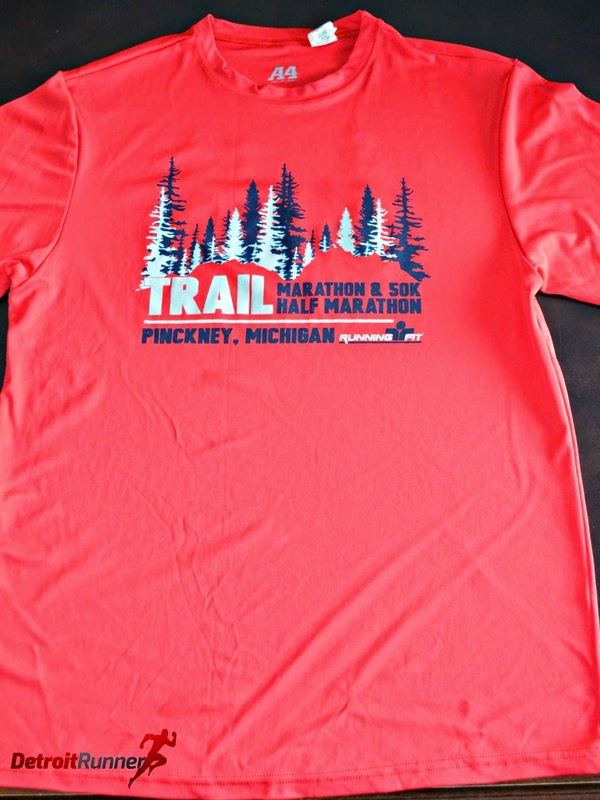 If you have not run a trail half before, this is a great one to try. You won't be disappointed with it and it will get you hooked on trail running. Dave, Kevin and I finished! OK so I looked at last year's report and while you say you ran faster last year you also said you push hard, so you must be happy that you aren't to much slower for an easy run, and were able to get out and run another 10km race the next day. Now the race looks like you can run fast, so what sort of time do the front guys run? Looks like an awesome course. I will definitely keep it in mind for next year!